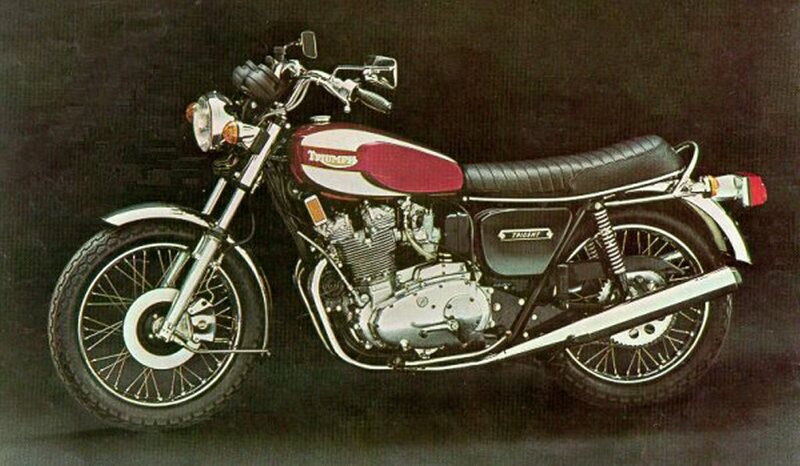 In 1975 while living in Hamilton NZ I got hold of a 1974 World Motorcycle Catalogue. 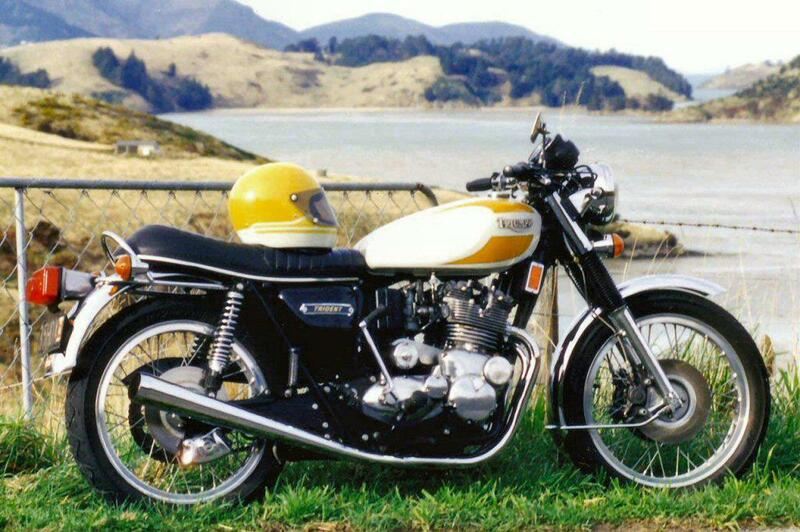 Within it I found a photo of a brand new Triumph - the T160 Trident. I was transfixed. 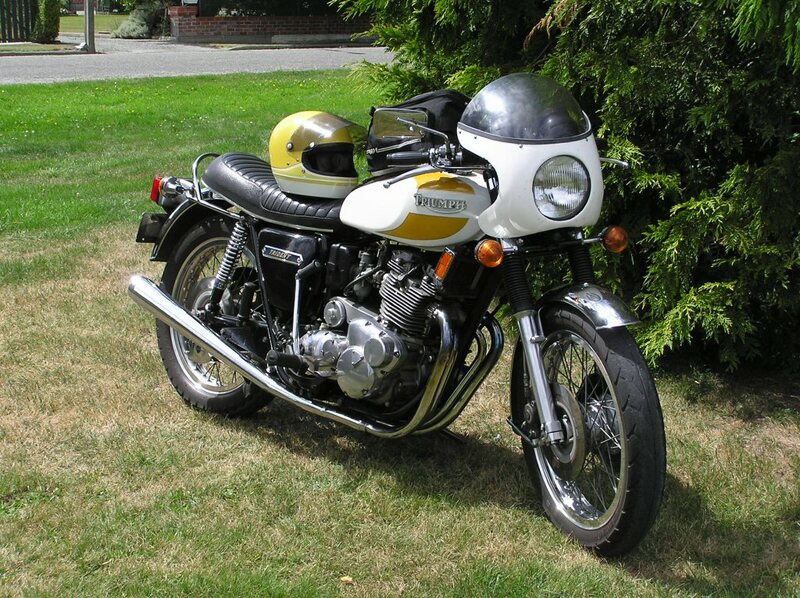 I had become enamoured of the sound of a "Triple" having undertaken some work on a T150 Trident that belonged to a guy over the road, and who had brought it to us to repair when it blew a head gasket - as we seemed to know what we were doing and did not belong to a gang. Having completed the repair I test rode it and despite it's ghastly state of tune I was most impressed with it's obvious potential. These things could really perform. I moved to Australia and caught sight of a T160 briefly in Brisbane in 1977. It looked fabulous but seemed to have hardly any exhaust noise - which was a shame as the exhaust noise of a triple is one of the wonders of the known universe. 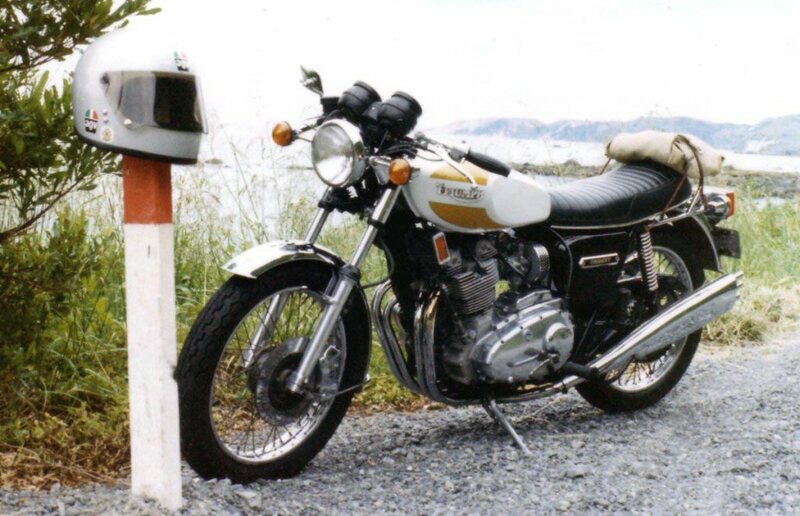 At the end of 1977 I was living in Gladstone Queensland and I was checking out the local bike shops. The local Suzuki shop had a brand new T160 Trident sitting in their showroom - I was astounded to be standing next to one. I thought about it for a few weeks then went back to see it again. I asked if I could have a test ride. The salesman said that they did not do test rides. I gave him $500. Suddenly they did test rides. I rode it as far as the meagre fuel level allowed then took it back. I said I would give him $500 a week until I had paid the total price after which I would take it home. I did. It came home 2 weeks before Xmas 1977. At this stage it had not even been issued a numberplate. I began to learn about and love my Trident. It had most forgiving and neutral handling and a wonderfully addictive power delivery, even though it was apparently rather stifled. 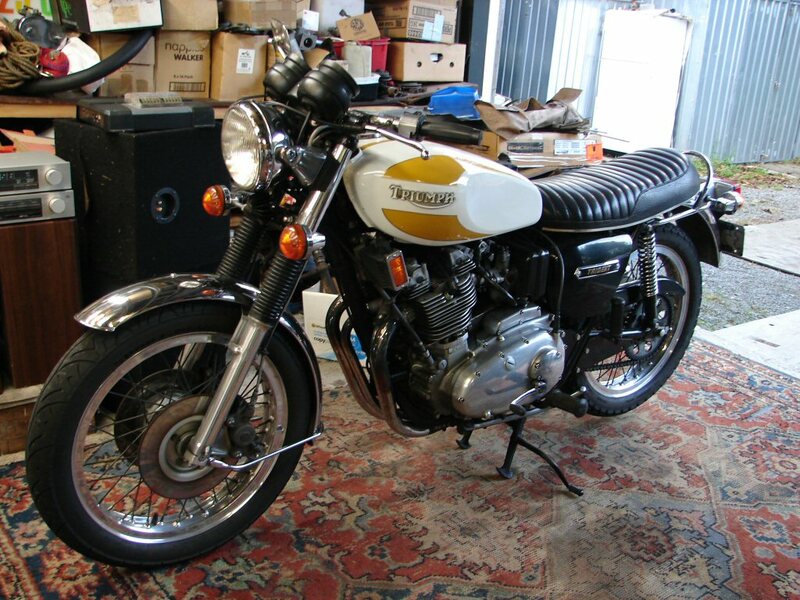 I shipped it back to NZ in 1980 where it was stored during a sojourn further overseas. On my return I began to experiment with tuning and intake/exhaust hardware. 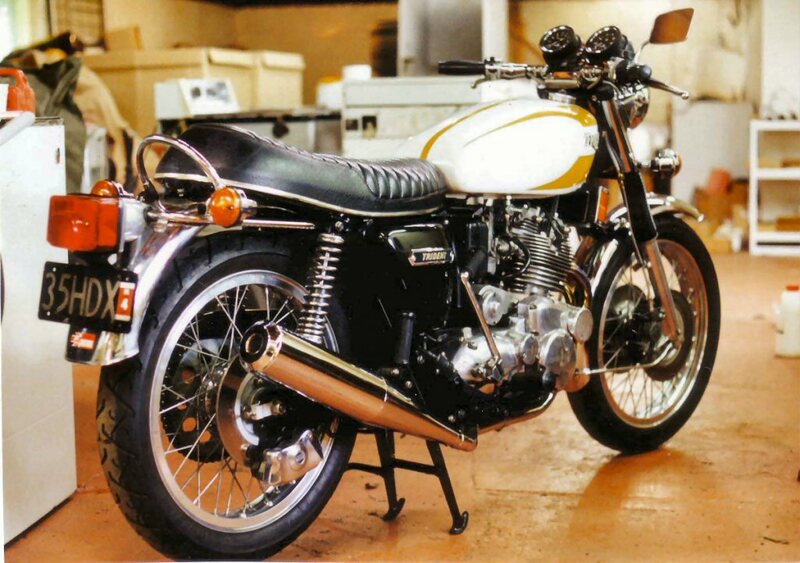 In accordance with thinking of the day I fitted earlier carb internals and airfilter as well as Raygun mufflers. I also fitted Laverda style handlebars as befit my "cafe racer" style view of things. 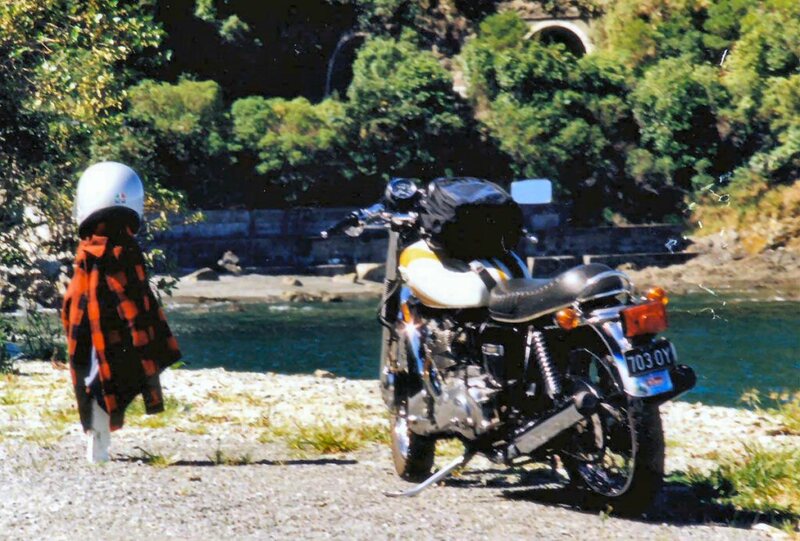 As New Zealand roads are generally twisty I removed surplus weight, electric starter, mainstand, anything I was not using at the time. It was all good fun. However, the bike became harder to live with. Starting was hit and miss, tuning was difficult, and even though I had fitted a Boyer electronic ignition, the spark was rather feeble. Also my raygun mufflers were rusting out for the second time, and importing new heavy bits from the UK was an expensive process. I decided to put it all back to standard and start the process again..
Apart from losing the lovely exhaust note, the bike became a joy to use anywhere anytime. It started easily and reliably, idled happily, and did everything in a highly civilised way. Obviously there was much more to customizing than just bolting on the bits that "they" said were best. By now I had clocked up 40.000 miles, and the bike was beginning to smoke a bit. There was a constant oil haze on the rear guard. I had learned a lot about the finer points of tuning this engine and wanted to use that knowledge to build a better one for me. I still wanted to retain the overall looks of the original styling which I thought were spot-on, but I wanted a bike with a bit more power and better ground clearance on corners, as I was wearing a lot of stuff away. I stripped the whole thing and began to build the best I could afford at the time. This would include some improvements to the braking and handling as well as the engine, thus the performance of the entire machine would be improved. Hopefully. The areas of frame improvement would be new Paoli rear shocks, Borrani alloy rims with heavy duty spokes, twin front disk brakes with AP racing callipers, Les Williams Legend 'bars, Avon Super Venom tyres. 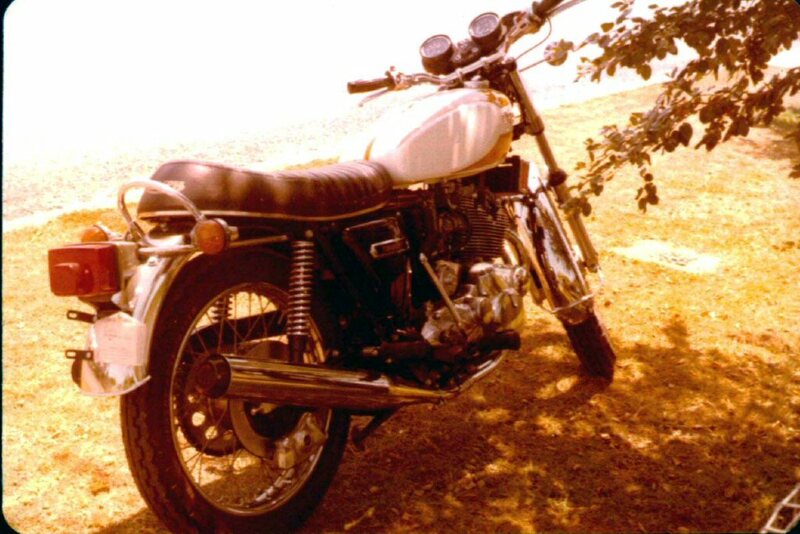 The engine would get a Hyde 830cc barrel and piston kit, Les Williams gasflowed cylinder head and corrected camshaft timing. Cylinder head also got new valves and guides and a few titanium bits as well as bigfoot valve adjusters. Only other mod was to have the cam followers re-radiused as was the thinking of the day. There would also be a Legend exhaust system from Les Williams which retained twin mufflers but they were much shorter and lighter plus made a bit more noise. It all came together and looked like this.. The bike performed so well that I kept looking for a 6th gear, as it developed much more torque at lower revs. That led to fitting a 45 tooth rear sprocket instead of the standard 50 tooth. Unfortunately my favoured method of cornering was seriously grinding away a lot of the collector of the new exhaust system - while at the same time consuming the new tyres at an alarming rate. At about the same time - 3000 miles later, I replaced both tyres and fitted a 3-into-1 exhaust system that a friend had built and which promised to offer more ground clearance. It not only did that, but it also made an incredible noise that let everyone know there was a bike around. 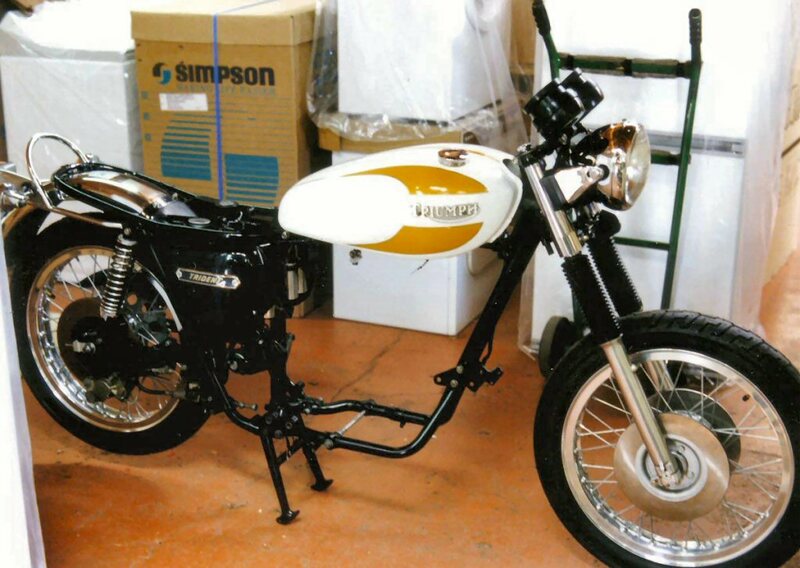 I was approaching the point in the development of my bike where it was everything I had wanted it to be.. Subsequent to this I replaced the rear shocks with Hagon units as the Paoli's gave up, and I fitted a period handlebar fairing just to take a bit of effort out of touring. It seemed to do so. The bikini fairing was suffering from fibreglass fatigue and starting to crack up. I decided to give it a spruce up but of course, that took time so I simply reverted to operating the bike without it in the meantime. I miss the better airflow offered by the air-shedding profile that the fairing offered, but I find that of recent times I use the bike more for day rides and fun stuff than touring, so I need to keep that in mind when I am deciding how it should be. Every time I fire this thing up and ride it out the driveway I am reminded how much it agrees with my soul. I can't express it in any other way - it simply makes sense to my entire being. I feel very lucky to have found this out, as I love all manner of motorcycles and am lucky enough to have experienced quite a few. Nothing makes as much sense to me as this does. 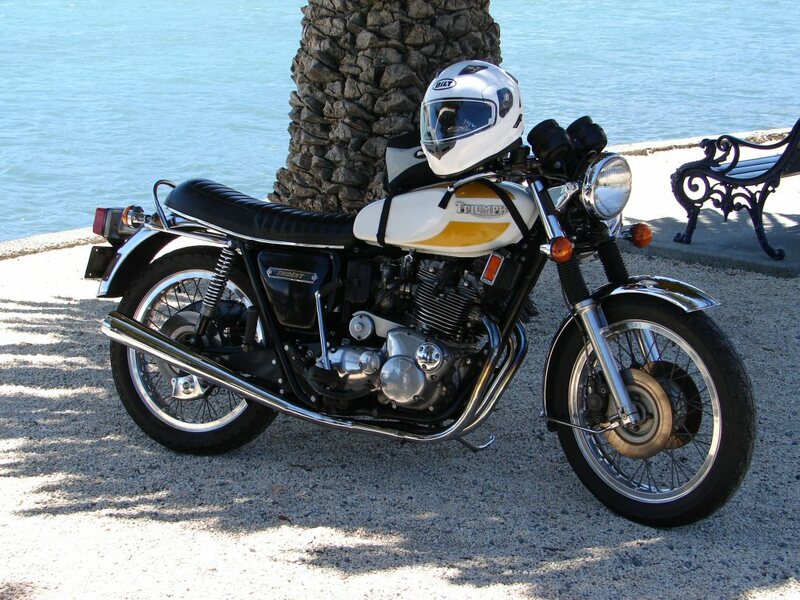 Every bike I bought subsequent to this one I thought - maybe this could be better - but none had ever proved to be so. They still have not. I have modified it to be more exactly what I wanted a bike to be, and it really is. I cannot think of anything extra I could add to make it more desirable to me. This is my most recent photo as of March 2018.